The world is excited about the upcoming MCU film, Avengers: Endgame. The movie is slated to release on April 26. But just a week before that Indian fans will, in all probability, go gaga over a Bollywood film. Dharma Productions' Kalank is opening in theatres on April 17. The movie stars Varun Dhawan as one of the male leads and we are here to talk about a video that he shared on his Twitter handle. The actor has been a fan of superhero movies, as he has revealed in several interactions with the media. So, he found a smart way to plug his own movie, Kalank, to Avengers: Endgame. Kalank Song Aira Gaira: Twitterati Call Out Karan Johar for Going Back on His Word to Never Use Item Numbers Again. 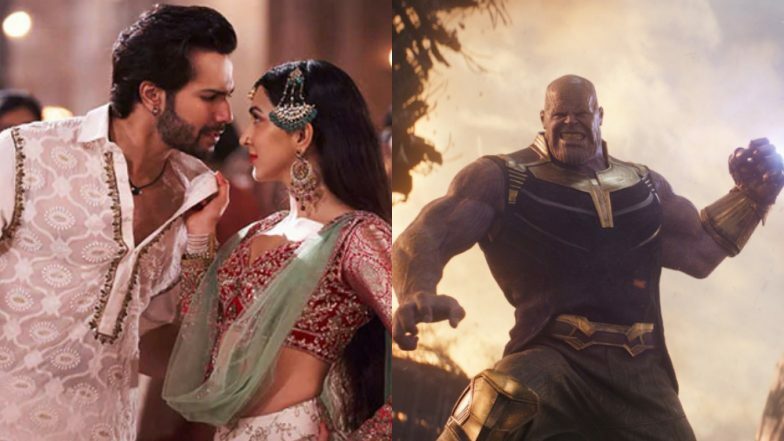 Varun took to his Twitter to share a funny video in which we see Thanos, the supervillain of Endgame and Infinity War, dance on the song First Class from Kalank. Spider-Man's there in the video, too. Well, Josh Brolin did not come down to India to shoot the special number, sadly. But this one's just a simple TikTok video. Avengers: Endgame New TV Spot: 'This is the Fight of our Lives', Says Captain America and We're Pumped Up Already - Watch Video. Okay, these TikTok videos are wildin'. It is tough to stomach seeing Thanos ke thumke. Imagine the superheroes breaking into a Bollywood dance number after defeating Thanos in Avengers: Endgame. Avengers: Endgame is currently making headlines as it has broken mane pre-sales records across the globe. Even before its release, the movie has become the sixth highest grossing film in China. Varun's Kalank also has a great buzz going on around it. The movie has been directed by Abhishek Varman, also stars Madhuri Dixit, Alia Bhatt, Sonakshi Sinha, Sanjay Dutt and Aditya Roy Kapur in lead roles.